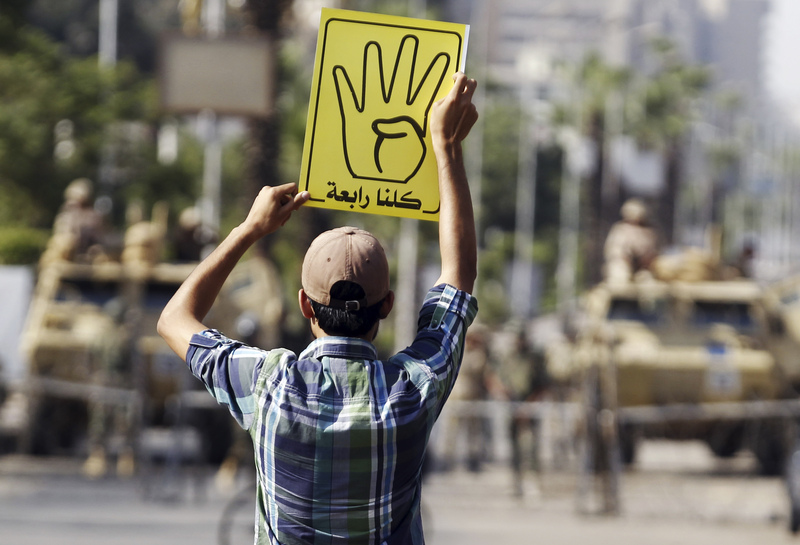 The four-fingered Rabaa has replaced the “V” symbol among the country’s protesters, and that could be a bad thing. This new hand sign refers to the Rabaa al-Adawiya mosque, the site of a violent confrontation between Morsi’s followers and the Egyptian army. Reported deaths from the clash range from hundreds to thousands of Muslim Brotherhood supporters. In Arabic, "Rabba" means “four” or “the fourth;” hence the new Rabaa symbol. During the Arab Spring, the Victory sign linked the disparate uprisings across the Middle East into a unified movement. From Libya to Egypt, from Jordan to Syria, the V gesture allowed protestors to communicate a set of shared ideals embodied in the initial self-immolation of a Tunisian fruit seller: half economic freedom, half national self-determination. As a visual image in the age of social media, the V helped the Arab Spring surpass the many linguistic and cultural barriers that crisscross the Middle East — otherwise, a rebel in Benghazi would have been hard-pressed to understand the dialect of a protestor in Tahrir Square. The V also allowed the anti-regime demonstrators of the Arab Spring to talk to the West. 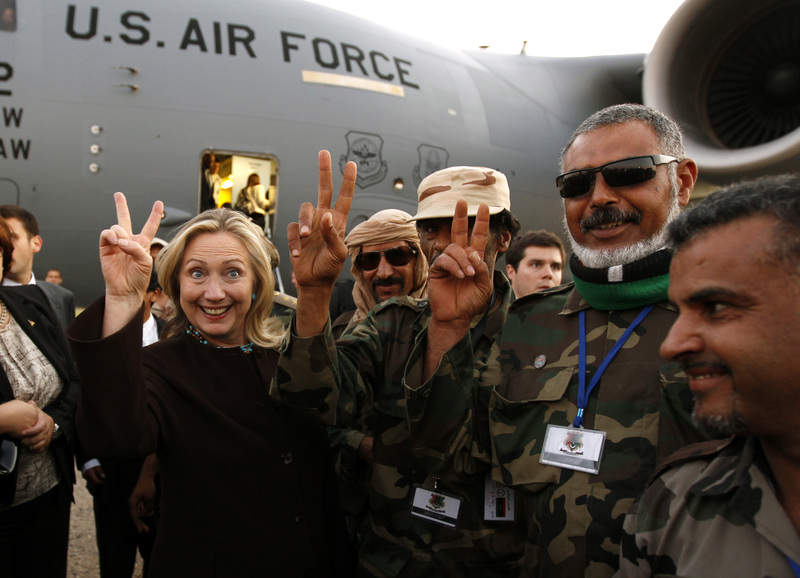 When Hillary Clinton met with Libyan rebels in October of 2011, she posed for a photograph in which she -- and they -- displayed a Victory salute. The message was clear: The U.S. and Libya share the same cause. First, with the Rabaa, the Brotherhood has chosen to limit its message to the Arab-speaking world. Unless you follow the intricacies of the Egyptian army’s crackdown on pro-Morsi demonstrators, the four fingers mean nothing to you. The word “Rabaa” itself is foreign to Westerners, and the new sign has no pre-existing connotations. The use of the Rabaa means the Brotherhood cares about building political support in their own region — and has written off Western political opinion as less important. Second, in using this new sign, the Brotherhood divorces itself from the legacy of the Arab Spring. Once he became president, Mohamed Morsi proved to be unsurprisingly undemocratic. He packed posts with Brotherhood members and tried to usurp powers for his party. Before his downfall, many commentators both within and outside Egypt complained that he violated the ideals of the revolution and subsequent elections that brought him to power, despite Morsi’s vows to protect democracy in Egypt. The Rabaa gesture allows Morsi supporters to avoid this recent and unpleasant past of broken promises. It diverts the conversation from the fact that the Brotherhood proved to be poor rulers who abandoned the promise of the Arab Spring and instead focuses attention on the Egyptian army’s atrocities. Third, the Rabaa is a manufactured symbol. Various reports place its origin in Turkey, not Egypt. It supposedly started spontaneously when Turkish soccer players scored a goal and raised four fingers into the air — to support those massacred at Rabaa al-Adawiya, they claimed. Soon after, Turkish Prime Minister Recep Tayyip Erdogan embraced the symbol and popularized it. In all probability, the Rabaa was likely a cleverly orchestrated campaign in Turkey to align Erdogan with the Brotherhood in a sympathetic fashion. Why does this matter? Here again, comparison with the V sign helps illuminate the Rabaa’s importance. In the Arab Spring, the V was organic. It thrived on Facebook and Twitter. No higher authority dictated its use. The pan-Arab and pan-Western connections the Victory sign symbolized were strong precisely because the V’s authentic spontaneity reflected genuine popularity. In sharp contrast, the Rabaa was intentionally constructed for a specific purpose. It reveals the Brotherhood’s roots as a political party and the propaganda upon which it relies. Morsi’s followers are not a popularly supported movement with a widespread and diverse base. Fourth, the Rabaa reveals the tensions between various factions in the Middle East. By rejecting the pan-Arab Victory sign, the Brotherhood distances itself from conflicts, such as Syria, where the V was in widespread use. For instance, Hamas supports the fundamentalist Syrian rebels, but Hezbollah does not — and both organizations have used the V as a political symbol. Rather than identify with Assad or the Syrian rebels or other entities in the Middle East, Morsi’s followers use the Rabaa to refer to Egyptian issues alone. In doing so, they sidestep complicated political divisions in today’s Middle East. For us Western observers, the Rabaa teaches an important lesson: As unrest continues in Egypt and across the Middle East, we should be aware not only of verbal rhetoric but also of the use of gestures. By flashing four fingers rather than the traditional V, the supporters of Muslim Brotherhood are signaling their rejection of an international movement and their embrace of a singularly Egyptian agenda. Nathaniel Zelinsky is a master's student in history at Clare College, the University of Cambridge.